About 6:00 AM at the Rotary Riverfront Park in Titusville, Florida, July 8, 2011. At left, the Space Shuttle Atlantis is perched on its launchpad. 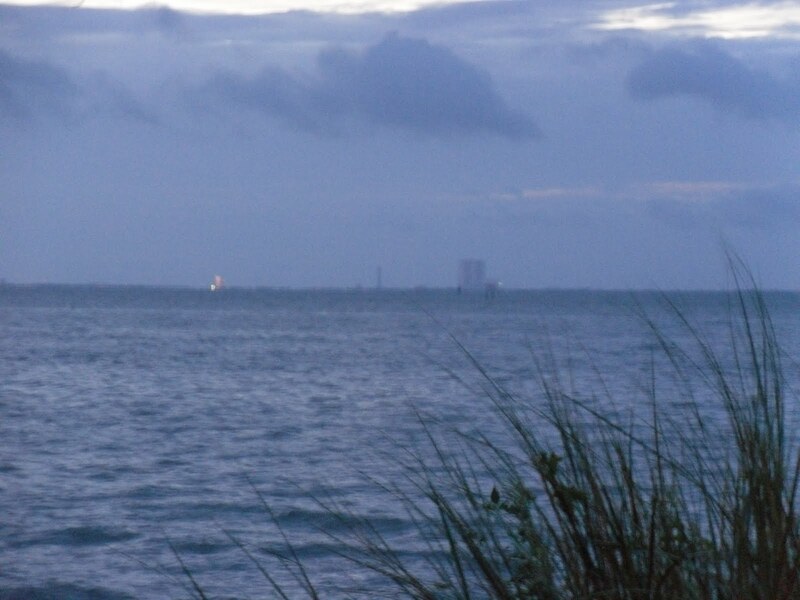 At right, one can see the Vehicle Assembly Building. Photo by Emily Carney. Little kids actually getting excited about seeing space shuttle launches. When I was young growing up in the early-to-mid 1980s, the shuttle program was actually a huge deal; one could easily see launches from North Pinellas County on a clear day. It saddens me to know that children won’t know the excitement of having a manned space program for an indefinite number of years. Seeing my little nephew playing with his space shuttle toy brings an odd sense of wistfulness and loss, as I think he’s missed out on a lot. God only knows what is going to happen to businesses around Brevard County, Florida. I feel bad for a lot of the people who live around Titusville and Cape Canaveral, as they’re about to get hit hard by the loss of jobs and tourists visiting to see launches and landings; remember, the shuttle program has been going on for over 30 years now. Titusville especially has been a very lovely, hospitable area since the dawn of the “Space Race” in the early 1960s to watch spacecraft launch. Even their area code is 321. The freakishly loud sonic boom which occurs whenever the shuttle enters the atmosphere over Florida. I’m going to miss this the most. There’s absolutely nothing like taking a casual walk somewhere with a buddy and hearing this giant sonic boom slice through the air, and saying casually, “Oh, yeah, that’s just the space shuttle…” From east to west, the sonic boom from the shuttle reentering the atmosphere is inescapable. There’s also nothing funnier than seeing the cat jump in mid-air, and then having Felix glare at you because he thinks your farts somehow made the entire house shake. Space shuttle reentry sonic booms have been upsetting small household pets for over 30 years now, and we’re going to miss it immensely. 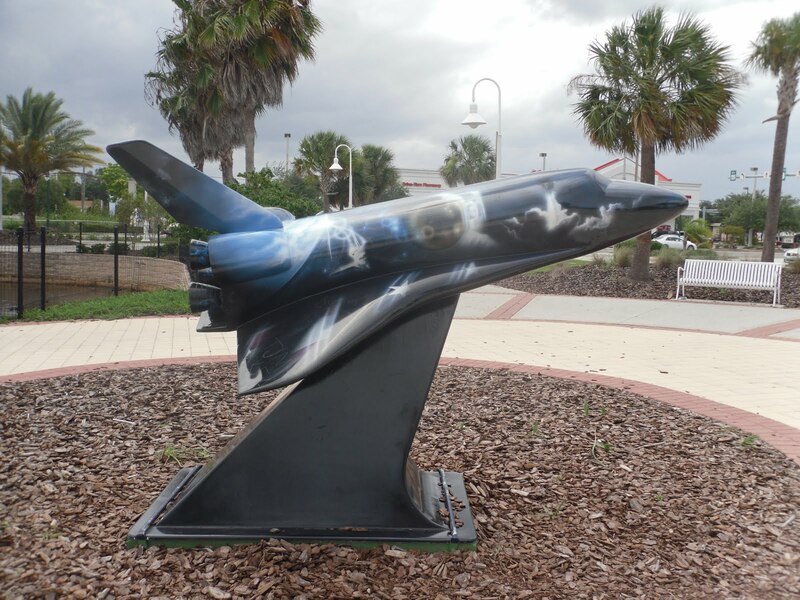 Space Shuttle tribute monument at Space View Park, Titusville, Florida. Picture by Emily Carney. Don't sound so sad. There has to be something to look forward to. It took us long enough to go from launching a monkey to sending humans 7 at a time. Taxi service to low-earth orbit will go commercial and NASA can focus on deep space exploration.